With the recent technological advancements and devices like sensors and smart devices, the Internet of things (IoT) has revolutionized the world of transportation. From parking management systems to air travel, the IoT in transportation is helping to improve the efficiency and convenience of modern travel. Not only this but IoT is also contributing to the world’s efforts at conserving energy with sustainable technology. What IoT solution in transportation consists of? A complete IoT solution in transportation integrates three distinct components: Sensors, Gateway and Cloud. Biz4Intellia, an end-to-end IoT solution is a well-integrated combination of IoT devices, IoT platform suite, and business services. Biz4Intellia came as a disruption to multiple industries with its pre-configured industry agnostic IoT solutions. Proximity sensors measure the distance between any nearest object and itself. These sensors are usually found on the bumpers of the car, which sends alert to the drivers in case if any collision occurs. The sensing power of the image sensors has revolutionized the industrial automation in a lot of industries like transportation, healthcare etc. Image sensors with IoT in transportation prevent the collision between different transport vehicles and hence sends alerts to the drivers. 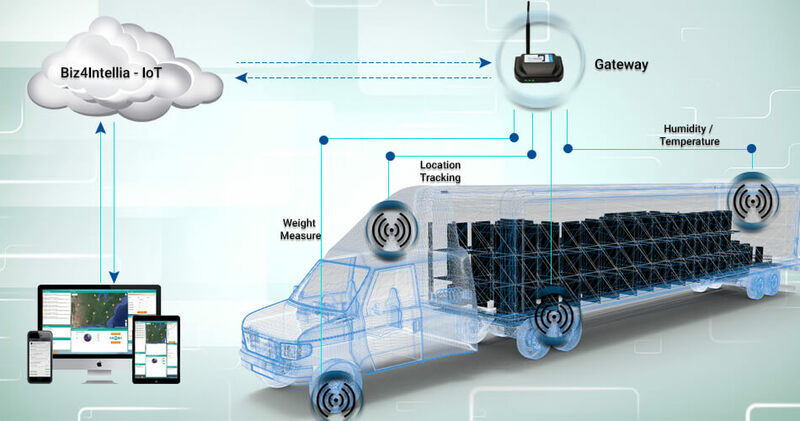 WKC204C is the weight sensor used by IoT solution providers to measure the weight of the truck/trailer with their IoT solutions. The WKC204C makes the weight measurement in the transportation industry more compact, durable and cost-effective to cater the high-resolution need of transportation industry. As the complete electronics communication integration is there, the requirement of an additional unit is not needed to communicate data to the clouds. The SensorBug®, integrated with IoT in transportation provides an interactive and user-friendly way to monitor, configure and control the Light, Vibration and Temperature. SensorBug® is a low-profile sensor which consumes less amount of energy and has its 3-Axis accelerometer to sense vibration. A digital pin-type humidity sensor, which is used to measure the relative humidity of the surroundings with the tolerance limit of up to ±1.8. The unique design of the humidity sensor, used with IoT in Transportation, allows for the best probable thermal coupling-decoupling, without consuming much energy. The MOXA G3150A-LTE is a secure and reliable LTE gateway with global LTE coverage. MOXA G3150A provides a more consistent connection to your Ethernet network and serial connection for cellular applications with NAT/OpenVPN/GRE/IPsec functionality. A Plug&Play Multichannel IoT gateway, containing up to 4 different radio interfaces, including a 4G/3G/GPRS/GSM, Wi-Fi 4.4 GHz (Access Point) and 2 XBee/RF radios that can connect to any sensor and communicate the ingested data to the cloud. The Monnit Gateway is based on a 3G (UMTS/GSM) wireless engine that has up to 50,000 sensor message memory. The battery inside the Monnit International 3G cellular Gateway allows it to last up to 24 hours if any power failure occurs. Back in the 19th Century, the data was stored in big, mainframe computer systems. As these systems were extremely large and expensive, it was not possible for each and every company to afford them and make the best use of the data they had. Instead, these large systems were owned by large corporations, government agencies, and universities. Soon came Microprocessors which reduced the size of hardware and can be brought in-house but still the cost remained the major issue. However, technologies kept updating, data can be stored at a cheaper cost with the help of the cloud. A cloud is a huge, interconnected network of powerful servers that perform services for businesses and people. Amazon, Google, and Microsoft are the largest cloud providers who have huge farms of servers and they rent as a part of their cloud services. Because the data could be easily stored in the cloud rather than on devices itself, it had a significant implication for IoT in transportation. Undoubtedly, a large number of sensors are used to collect data and then make real-time intelligent decisions, using cloud was equally important for aggregating data and an insight into them. Satellite, Wi-Fi, Bluetooth, WAN, internet are some of the methods through which the sensor is connected to the cloud. After receiving data from gateways with the help of different protocols, data is further sent to the cloud. Next, the software starts processing the data and make useful information out of it. Later, the useful information is sent to the user and alerts are sent as reminders or notifications to notify them about any mishappening that can occur.